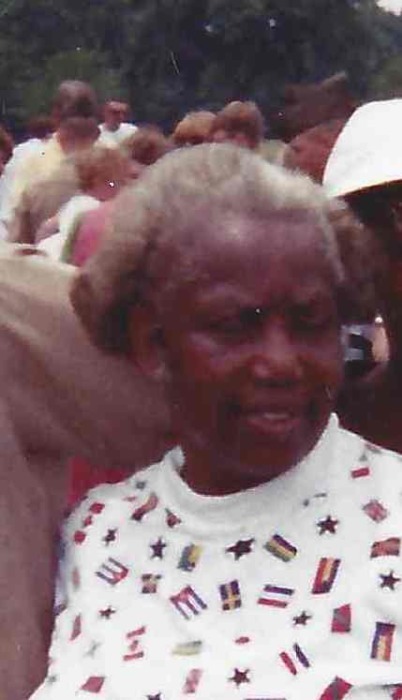 Mother Janie Mae Thompson, 76, departed this life Thursday February 7, 2019 in Florence County. She was the mother of Robert Thompson, Debra Thompson and Faye Thompson. You may visit the family at 805 Phillips Court Marion between the hours of 12:00- 7:00pm. Funeral services are scheduled to be held at the Refuge Family Worship Center Marion Saturday February 16, 2019 at 11:00am. She will be laid to rest in the Devotion Gardens Cemetery, Mullins. On a Thursday morning, God chose a new flower to add to his garden. He named this flower Janie. Mrs. Janie Mae Thompson was born in Marion, SC on August 22, 1942, a daughter of the late Robert and Curlene Bridgers. She entered into her final resting place on Thursday, February 7, 2019 at Carolina Hospital Systems in Florence, SC. She received her formal education in the Marion County Public School System. She accepted Christ at an early age and was a member of Household of Faith, Faith Apostolic Church, and she last served and dedicated the rest of her time here at Refuge Family Worship Center where Bishop Simon Jenkins pastored until his passing and where Elder Gearl Roberts pastors now. Janie married J.W. Thompson on September 7, 1968, and they were blessed with three children. She lived the majority of her life here in Marion where she worked at Sara Lee and So Pak Co until she transitioned into being a daycare provider and longtime foster parent. She was a mother to many who could not be with their mother at the time. She did not let the work of caring for some of the kids with disabilities deter her from taking them in. In fact, it seemed as if she spoiled them more. She also provided food, shelter, and clothing to those who did not have anything to eat, no place to stay, or no clean clothes to wear. Everybody knew who someone was talking about when anybody said, “You know the lady that stays behind IGA on the corner.” Janie loved to sing, whether it was in church, around the house, singing to her grandchildren, or in the yard gardening, which was one of her favorite hobbies. Janie was also blunt and matter-of-fact as well, so that there was no confusion in what she meant when she said it. Those left to cherish Janie’s memories are: her three children: two daughters, Debbie Thompson and Faye Thompson of Marion, SC and her one and only son, Robert (Nicole) Thompson of Florence, SC; four grandchildren: Robyn “Moo Moo” Thompson, Tanasia Thompson, Tre’von Thompson, and Raven Felder; one sister: Pearline Zwanzig of Ridgewood, NY; Teresa Moore, whom she referred to as a daughter and Connie Foxworth, who provided care for her in the home out of the kindness of her heart and a host of nieces, nephews, other relatives and friends.